Many people were shocked when an autopsy report attributed “Star Wars” actress Carrie Fisher’s death, in part, to sleep apnea, along with other factors. Affecting more than 18 million Americans – who reportedly include such celebrities as Shaquille O’Neal, Rosie O’Donnell, Regis Philbin, Roseanne Barr and Rick Perry – this common sleep disorder often goes undiagnosed and untreated, despite its potentially serious or even fatal complications. If untreated, obstructive sleep apnea (OSA), which causes people to stop breathing repeatedly during sleep, sometimes dozens of times a night, can raise risk for high blood pressure, heart attack, stroke, type 2 diabetes and heart failure. A 2013 study by the Mayo Clinic also linked sleep apnea to significantly higher risk for sudden cardiac death. Why is OSA so dangerous and how can you safeguard your heart health if you have it? Here is a closer look at OSA, which is on the rise in both men and women. OSA symptoms include loud snoring, choking or gasping during sleep, restless sleep, waking up with a very dry or sore throat, daytime drowsiness or lack of energy, morning headaches and trouble concentrating. High blood pressure that doesn’t respond to medications can also be a warning sign of undiagnosed sleep apnea. If you fit this scenario, talk to your medical provider about being checked for sleep apnea, even if you don’t think you snore, since many people with OSA are unaware of their symptoms. Sleep apnea is twice as common in men as women, but rates in women are rising, mainly due to the obesity epidemic. About 50% of people diagnosed with sleep apnea are overweight or obese. Other risk factors include smoking, a family history of OSA, having high blood pressure or diabetes, chronic nasal congestion, and asthma. However, anyone can develop OSA, even children. What’s the link between OSA and cardiovascular problems? Sleep apnea harms cardiovascular health in several ways. Recent studies suggest that OSA – rather than obesity – is a major cause of adverse changes to the blood vessel lining (endothelium) that makes it easier for plaque build-up to occur. OSA also contributes to endothelial inflammation, one of the root causes of CVD. Sudden drops in blood oxygen levels during apnea episodes raise blood pressure, which in turn increases risk for risk for heart attacks and strokes. OSA also increases risk for atrial fibrillation, a heart rhythm disorder that puts people at increased risk for stroke. The more severe OSA is, the higher the risk for CVD, the leading killer of Americans. What’s the best way to find out if I have OSA? Ask your medical provider if you need a sleep study. This test involves being hooked up to equipment that monitors heart, lung and brain activity, and your breathing patterns, when you’re sleeping. To help your provider evaluate your symptoms and the need for testing, bring a diary of your sleep patterns, level of drowsiness during the day, and any symptoms you or your bed partner notice during the night. 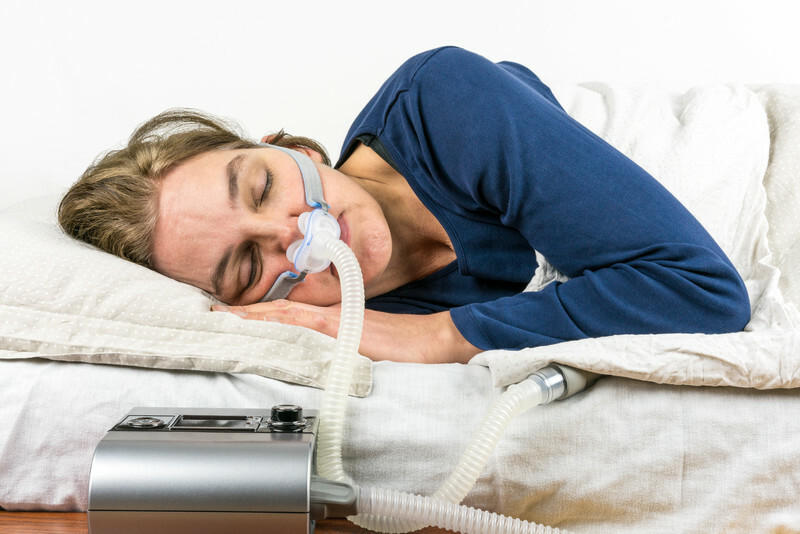 OSA is often treated with a continuous positive airway pressure (CPAP) machine. This involves wearing a mask over your nose and/or mouth that gently blows air to keep your airways open during sleep. In studies, use of these devices has been shown to dramatically reduce or even eliminate CV risks. Lifestyle changes, such as weight loss, quitting smoking, and exercising more, are usually advised as well.